This year I decided to gather my thoughts and bring you my 2017 Beauty Heroes favourites. There has been so many amazing boxes this year and I struggled not to pick all of them. In the end I opted for 6 Beauty Heroes boxes (I'm a Libra alright, I can't decide) which I loved just a tad bit more than the others. 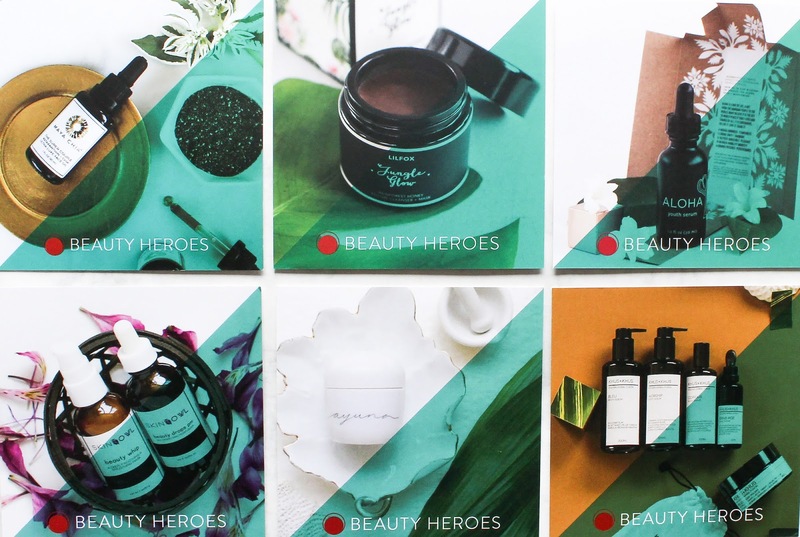 And if you don't know what the heck Beauty Heroes even is, then you can read a whole lot in my introduction post to BH here. It's a monthly subscription discovery service. In each box you get a carefully selected full-size (not sample!) Hero Product and one or more Sidekicks + exclusive 15% ongoing discount as a BH member. You can subscribe here. The founder Jeannie Jarnot and her Beauty Heroes team are the best and I'm so grateful to be working with them. It really was a dream come true when Jeannie invited me to be one of their Brand Ambassadors. I utterly adore Jeannie and what she and her team are doing for beauty community. I also utterly love and adore their curations which are almost always a massive hit in my book. With that said here are my favourite from this year. Oh and before I start with them I want to say that if it weren't for Beauty Heroes I probably wouldn't try all these beautiful products and brands this year. Out of the six brands here I've only tried one before and that was also from a previous BH box. "A brand that was on my wishlist" & "I was so excited to try it out", these are the sentences I would use for every single box but I don't want to repeat myself haha. Blah blah, here they are now. January Beauty Heroes Discovery featured Maya Chia, a brand that is all about Chia Seed Oil, which has been clinically proven to increase skin hydration, improve skin barrier function and reduce transepidermal water loss. All my Slovenian ladies, if you're interested in trying out 100% Chia Seed Oil I saw it in Muller and Biotopic. The Hero product was The Super Couple*, a stunning facial oil with Chia Seed Oil, of course, and Astaxanthin from microalgae, with over 65 times the antioxidant levels of Vitamin C. There are also 12 other skin-supporting botanicals, like Jasmine, Bulgarian Rose and more. This serum is divine! It was everything I hoped for. And more. My skin looked so good when I was using it, I loved it. It helped with hyperpigmentation, my skin was glowing and it was just really lovely and healthy looking. The Super Couple is truly beautiful. Oh and the colour? Gorgeous! The Sidekick was the Limited Edition Waterless Wonder Balm* which I actually just mentioned in one of my previous posts here. It's equally beautiful and oh so hydrating. It really seals in the moisture + it has such a yummy scent. My first impressions here. April Beauty Heroes Discovery featured Lilfox, a luscious and whimsical skincare line. The Hero was the Jungle Glow Enyzme Cleanser + Mask* which I loved so much I got myself another April box. Jungle Glow is based on one of my favourite ingredients - honey. More precisely Raw Rainforest Honey from Hawaii and that is pretty much all I need to know to fall in love with a product. Among the ingredients are also Maracuja Oil, Amazonian White Clay and Raw Cacao. I either use it as a morning cleanser/two minutes face mask or a full on face mask, which I leave on my face for at least 20 minutes, but preferably longer. It's hydrating, it's gently exfoliating, it's brightening, it makes my skin smooth and soft. It's dreamy. The Sidekick was Cleopatra Restorative Milk + Honey Beauty Mask*, with Coconut Milk, Rose Petals, French Rose Clay and more. This powdered mask is beautiful as well. My full review here. June Beauty Heroes Discovery featured a Hawaiian brand Honua Skincare. The Hero was Aloha Youth Serum* which I loved dearly. Full of wonderful ingredients this hydrating and calming serum worked amazingly well on my skin. It keep it soft and plumped and I truly enjoyed this little gem. The Sidekick was Olena Turmeric Beauty Oil* and its scent wasn't a favourite of many. True, the scent wasn't my favourite either but the results on my skin sure were! This oil is divine. Anti-inflammatory and brightening this oil also helped reduced post-acne spots and sun damage on my skin. Oh it's so good. I really loved both of these products so much. When I was using them my skin was looking extra healthy and redness-free & I also had less naughty spots. Really beautiful. More here. Honua just came up with a new product which is a mask and I'm very excited to try it out. September Beauty Heroes Discovery featured SkinOwl, which to me was so special because my first Beauty Heroes box ever featured Skin Owl. The Hero product were Beauty Drops PM, Maqui Berry*. This oil replaced Beauty Drops PM Mangosteen, because Mangosteen was no longer possible to sourced in an ethical and sustainable way. I have to say I like the new version even more. I find this oil hydrating and calming (maqui berries are anti-inflammatory) & I know lots of ladies with acne prone skin loves it. My friend also adores it and she has been using it non-stop! We are both on our lasts drops. The scent is also out of this world amazing! Sweet and fruity and just aah. The Sidekick was their new Beauty Whip Maqui Berry* which is Such a gorgeous product! It's a mask, it's a primer, it's a moisturizer, it's almost anything you wish. I LOVE using it when I'm having a bath or when my skin is in that confusing hormonal state when it can't decide between having spots or dry patches. It sorts both out and I love that. It's hydrating & balancing at the same time. It decreases or diminishes spots through the night. I also love the initial feeling I get from it - it's cooling, because I store it in the fridge. A bit more here. November Beauty Heroes Discovery featured the amazing Spanish brand Ayuna, Less Is Beauty. Oh my word, this box was SO good. The Hero was Essence Cream-in-Oil Peel* which is one of the best and most fun-to-use exfoliator/product I've tried. In my experience, Ayuna products are magical. Essence is a whipped cream exfoliant with the most beautiful cloud-like fluffy texture that reveals skin's radiance in three phases. You apply it as a mask and then gently roll it off your skin with fingers. It's not a scrub with beads in it so it's not harsh. After removing it completely with a dry cloth you're left with a lightweight oil on the skin and that just blows my mind. From a mask, to exfoliator and then to an oil. What?? It's amazing and not only that it makes my skin softer and smoother, the whole experience is so lovely and my skin always looks amazing the next day. In this box there were two Sidekicks, Ayuna Nourishing Artisan Soap* and Rejuvenating Cream II*. Both gorgeous as well. I just can't with this brand, how can it be so good? I can easily use the soap on my face, no problems, no tightens just clean and fresh skin. I misjudged the Cream II at the beginning cause I thought it would be a bit much for my combination skin, but boy was I wrong! It's rich in ingredients that bring my skin to life, it's nourishing and hydrating but NOT at all heavy or thick. My skin drinks it up like nobody's business and then, even tho it's fully absorbed, it moisturizes my skin all day (or night). Review here. December Beauty Discovery featured Khus + Khus, a unified, holistic line of hybrid philosophies, rooted in the fundamental belief that botanicals work within the body through the bloodstream and nervous system to deliver specific results, as well as broad benefits. The Hero was the Bleu Body Wax*, which is a stunning body balm/wax/goodness that brings peace and serenity. Not only with its ingredients and scent but also with its blue colour. The big jar of Bleu is so lush (and heavy! ), the wax is very moisturizing and I love using it all over my body, as a hand cream, hair treatment, even an evening oil cleanser. Love. The Sidekick is the Sans Age Face Serum* (more here) which I love as well. It's very soothing and anti-inflammatory and it's just what I needed. Blue Tansy, German Chamomile, Helichrysum, I love thee so much. Such a special brand. Review of Bleu Body Wax here. Oh goodness, it wasn't my intention to write this much, and I already hold myself back as it is! When you love, you love and you just want to say a lot. I love and highly recommend all these products and brands. They are so special and each one is unique in its own way. Like I said, I'm so very grateful for Beauty Heroes and their amazing curations. LOVE. "How can you invite more Love into your life right now?" - Jeannie Jarnot. And on that I'm wishing you a very Merry Christmas!